In 2014, the British Royal Mint surprised the coin world with its first edition of a coin series in gold and silver dedicated to the topic to the Chinese lunar calendar. In addition to China and Australia, Great Britain is now the third country to issue a so-called Lunar Series. The "Year of the Horse" 2014 and "Year of the Sheep" 2015 silver coins were followed by the current "Year of the Monkey" 2016 edition. If you would like to buy this beautiful edition of the UK Lunar Year of the Monkey 2016 silver coin series, you can buy this at CoinInvest in just a few clicks. Our online shop offer you a wide range of current and older coin issues in gold, silver or platinum. Would you like to sell your coins or gold bars? CoinInvest is also the most appropriate point of contact for this. Write us an email or contact us by phone to do so and we will find the best current price for your coins or precious metal bars. In 2013, the Royal Mint released its first coins named UK Lunar, the Shēngxiào collection, as it is called in Mandarin, dedicating each issue to the current zodiac signs of the Chinese calendar. Contrary to the zodiac signs of the Gregorian calendar, the signs of the lunar calendar apply for an entire year thus give the calendar years their names. Together with the five elements of wood, fire, earth, metal and water, they form a comprehensive cycle that is repeated every 60 years. Following the first issue with the title 'Year of the Horse" (2014) up to and including 2019, other coins with the titles "Year of the Sheep" (2015),"Year of the Monkey" (2016),"Year of the Chicken" (2017),"Year of the Dog" (2018) and "Year of the Pig" (2019) are planned. The UK Lunar series has been available in two versions respectively since it was first issued and bears the same motif as the UK Lunar Gold and UK Lunar Silver. The motifs of the UK Lunar series are designed by the British artist Wuon-Gean Ho each year and are available in two different minting qualities (proof and mint condition). The blanks for the coins are made of high-quality silver with a fineness of 999.9/1000 and have a nominal value of 2 English pounds. In 2015, the picture side of the silver coin shows a monkey that appears to be jumping from a tree on the left side of the picture to another tree that is not visible. With outstretched arms and elongated body, he reaches for his goal. In the background, between the branches of the tree, another small monkey can be seen swinging along between the branches. The depiction of the surroundings allows the tree to stand in high grass and lends a convincing naturalness to the overall representation. The lovingly detailed execution of the animal and plant world is impressive and adds a very special charm to this coin series. To the right of the monkey, the Chinese characters can be seen, which state the name of the animal and thus the coin also. Above the motif there is an inscription that reads "YEAR OF THE MONKEY" and the year of issue "2016". As with all British coins, the front shows the Head of State Queen Elizabeth II. After 16 years of the portrait of the queen by the artist Ian Rank-Broadley being seen on the coins of the Commonwealth, since 2015 they have shown an updated image of the monarch by Jody Clark on the nominal side. The inscription states the official payment value of "2 Pound" as well as the name of the depicted "ELIZABETH II" with the additional abbreviations "D.G. REG FID DEF" referring to the Latin words "Dei Gratia Regina Fidei Defensor" (Queen by the grace of God, defender of the faith. 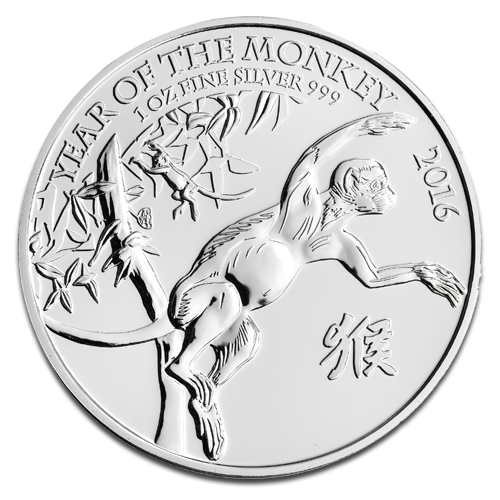 As the circulation for the UK Lunar Year of the Monkey 1 oz Silver 2016 is limited to a maximum of 300,000 coins, the silver coin is not just a popular item with collectors. The coin also promises investors a potential increase in value and is therefore also suitable in larger numbers as a new acquisition for investment portfolios. However, the circulation of the proof version can vary depending on the year of issue. 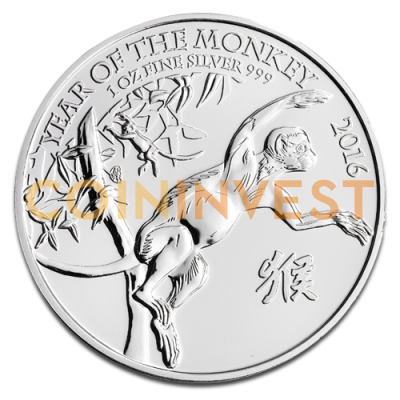 At CoinInvest, you receive the UK Lunar Year of the Monkey 1 oz Silver 2016 as a single coin in a coin capsule and in larger quantities of 20 units in foil. In the case of an order for 100 coins, we deliver the coins to you in the appropriate coin box. I like the UK Lunar series and had picked up the previous 2 coins, so I had to pick up this one. Nice series, not a patch on the Perth Mint Lunar coins, in my opinion though! More attractive design than previous RM Lunar coins, but not as collectable than the Perth Mint Lunar coins. Their mintage is lower, and they carry a high premium. A nice addition to a collection, but not suitable and too expensive for a large part of a silver portfolio.